Well, the hypertension, stroke, and Heart Attack can be prevented and even cured (if it is not too late) with Hijamah. Hijamah is an Islamic Medication that is more effective and cheaper than modern medication. If in the modern hospital you should pay US$ 1,000 to 1,000,000 for stroke, with Hijamah you only pay US$ 40 to US$ 200. Hijamah is removing the toxin and virus from your body by taking the dirty blood (which contains cholesterol, virus, etc) out of your body. 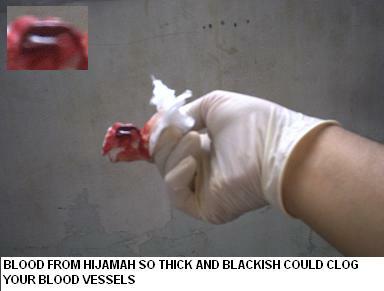 The way of Hijamah is similar to blood donation that take your blood away with a big needle.